Last month I introduced all of you to actor Ben Pace (C'00) and his fun "Elevator" series in which he stars as "Harold the Janitor". This web series which was developed in the HBO Lab and has recently been bought by Break Media, launched a fun, campy, "Halloween" mini-series this week. In the 4 episodes, "Harold" (Ben) figures out a new way to get the girl. Watch these 4 very short videos through and I think you'll agree with me that Ben is indeed a great, slick comedic actor. Harold reveals a bloodthirsty secret when he gets his 25 years of service award. Vampire Harold has a passionate exchange with his beloved and Chris is caught in the middle. Robert shares his own monstrous secret to Vampire Harold. Harold is not amused. Something is killing employees all over the building. Vampire Harold has to come clean to stop the murders. Let's not forget about the other musical "World Series"-related Penn act I covered yesterday! This performance is surely up there with some other great memorable John Legend ("Penn") performances we've covered HERE and HERE. While I'm not a huge sports fan, as a Penn alum I can't help but get excited for the Phillies being in the World Series (and winning last night). So on that note, in this whole Phillies frenzy, check out the video above of Penn's Glee Club singing a revised version of Bruce Montgomery's "Ain't-Cha Never Heard Of?" (originally released in 1989). The lyrics have been adapted to highlight the Phillies' coaching staff, top executives and names the complete roster from the 2009 National League Championship Series. Recently, Mike Missanelli of ESPN Radio (950 AM / 97.5 FM) played the song and gave a big on-air plug to the Glee Club. Let's all rally together to get more airtime by sending an email to "MikeMiss@950ESPN.com" or call the "Air Studio" (if you want to wait and try to get on the air on Mike's show) at 610-632-0950 -- or both! And watch out for the audio track to go on sale on the Penn Glee Club's website soon! Speaking of the World Series, check out DJ Gregory's (W'03, Off the Beat) vlog below as he analyzes "starting pitching, offense, the bullpens and the managers to find that the difference maker may be the experience factor." How Penn Is Going Virtual Within "Second Life"! 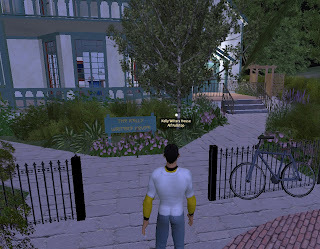 This Thursday, October 29, (8 pm eastern time), Penn's Kelly Writers House goes virtual ...inside "Second Life"! For this week's seminar, KWH director Al Filreis will be discussing three poems, one each by Cid Corman, Ezra Pound and William Carlos Williams. 2) Ezra Pound, "The Encounter"
3) William Carlos Williams, "Between Walls"
When you arrive at the Second Life KWH, and come into the Arts Cafe (their main reading room) you'll see chairs set up for us, and wall displays on which you'll find the text of the poems. For those who will want to actively participate, to gain access to this event please contact Deke Kassabian (vdeke at isc.upenn.edu) no later than noon today. The Kelly Writers House always seemed ahead of the curve thanks to Al Filreis. Check out this news segment with Al from back in 1999. Last week, Jesse Tendler (W'02, Eng'03, Mask and Wig) and his liberal activist group Billionaires for Wealthcare interrupted *AHIP pollster Bill McInturff during his closing speech of the insurance lobby’s conference. No stranger to musical spoofs from his Mask and Wig days, Jesse and company did their own rendition of “Tomorrow” from the musical Annie. *AHIP is the powerful insurance lobby that spends 5 million dollars a week trying to kill health care reform. Billionaires for Wealthcare is a grassroots network looking to stop them - with song. Who let these hippies in here? Hey, those "costs" are my profits! Exactly. To us. Am I in the right room? OR REFORM IS A CORP'RATE GIVE-A-WAY! Well, I've heard enough - my helicopter is parked in a handicap space. ...And check out this other hysterical "Annie" take-off video from yet another Mask and Wig alum HERE! Last week, while I was hanging out with Kevin Bacon, I was chatting with his entourage and was turned on to a great UK Techno band called "The Egg" who will be playing in Philly later this week.